Barbara Herlihy, PhD, LPC, LPC-S, is University Research Professor in the Counselor Education graduate program at the University of New Orleans. She has served on the American Counseling Association Ethics Committee as chair and as a member and as a member of the task forces to revise the 1995 and 2005 ACA codes of ethics. 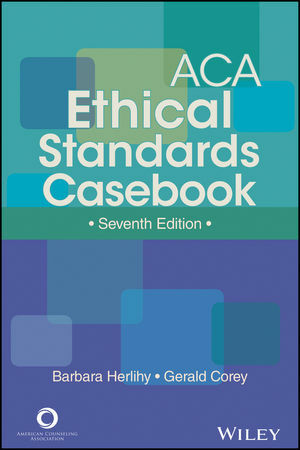 Dr. Herlihy is the coauthor of several books on ethical issues in counseling: Ethical, Legal, and Professional Issues in Counseling; Boundary Issues in Counseling, the ACA Ethical Standards Casebook, and Dual Relationships in Counseling; all with Gerald Corey; and the ACA Ethical Standards Casebook. She is also the author or coauthor of more than 50 journal articles and 25 book chapters on ethics, multicultural counseling, feminist therapy, and other topics. She is the recipient of the Southern Association for Counselor Education and Supervision Courtland Lee Social Justice Award and the Association for Counselor Education and Supervision Distinguished Mentor Award. She is a frequent presenter of seminars and workshops on ethics across the United States and internationally, most recently in Malta, Venezuela, and Mexico. Gerald Corey, EdD, ABPP, NCC, is a professor emeritus of human services and counseling at California State University at Fullerton. He is a Diplomate in Counseling Psychology, American Board of Professional Psychology; a licensed counseling psychologist; and a Fellow of the American Counseling Association, the Association for Specialists in Group Work, and the American Psychological Association, in both Division 17 and Division 49. He is the recipient of both the Lifetime Achievement Award from the American Mental Health Counselors Association in 2011 and the ASGW's Eminent Career Award in 2001. Dr. Corey has authored or coauthored 15 textbooks in counseling that are currently in print, has made fi ve educational DVD programs on various aspects of counseling, and has written numerous articles and book chapters. Some of his coauthored books include Issues and Ethics in the Helping Professions, Becoming a Helper, I Never Knew I Had a Choice, Groups: Process and Practice, and Theory and Practice of Counseling and Psychotherapy. In the past 35 years the Coreys have conducted group counseling training workshops for mental health professionals at many universities in the United States as well as in Canada, Mexico, China, Hong Kong, Korea, Germany, Belgium, Scotland, England, and Ireland.